This history is dedicated to three people. First and foremost, in memory of my main protagonist himself, my great-great-great-grandfather Tolleif Thomsen, but also to Tolleif George Thomsen who wrote "Tolleif Thomsen Saga" and to Keith Thomsen who wrote the update "Mythic mutiny." This story is a follow-up to those stories. 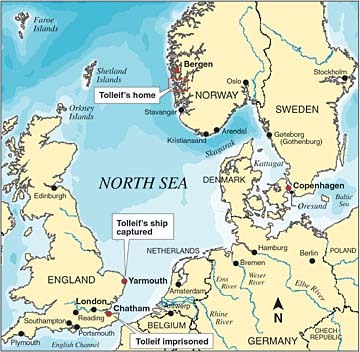 From the stories named above I came to know that Tolleif Thomsen was imprisoned in England during the Napoleonic Wars and that he was involved in a mutiny, but not where or when he was captured and where he was imprisoned. I will come back to that below, but I will begin this history with a short background for the whole. 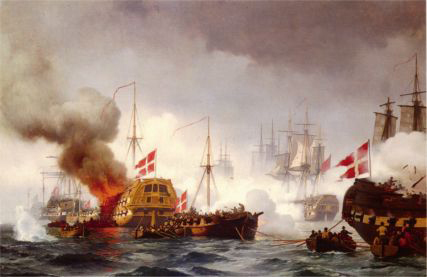 In the end phase of the prolonged Napoleonic Wars the kingdom of Denmark-Norway went to war with England (1807-1814). Before 1807 Denmark-Norway was in a position as a neutral shipper. England and France blockaded much of each other's imports and exports and were sometimes dependent on products from other countries, among them Norway, for such articles as lumber, fish and iron for war material. Already in July and August 1807 the English began to confiscate Norwegian and Danish ships. In the first week of August a large British fleet lay in the Øresund. After some days the English made a landing on Zealand Island, and on the evening of Sept. 2, 1807, they began to bombard Copenhagen. On Oct. 1, the total of confiscated Danish-Norwegian ships came to 335, and on Oct. 20 the English went home again with the whole of the Danish-Norwegian fleet as spoils of war. For the rest I point to "Mythic mutiny," were Keith has made a thorough research for the time period. From the Battle of Copenhagen. Painting by Neumann. The original can be seen at Fyn's art museum in Odense. The official declaration of war didn't come until Nov. 4, 1807, but by that time many sailors had already been captured and imprisoned, among them Tolleif. During the time period 1807-1814 Norwegian ships were exposed to capture; ships that broke the blockade could be captured by a privateer, who took the crew prisoner and sent both the ships and saliors to England. 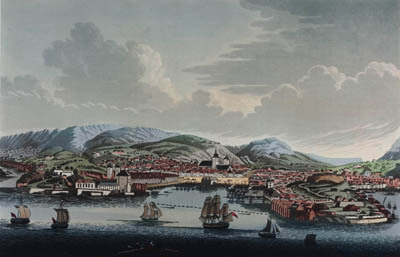 On Aug. 14 1807 the ship Welforenniet left Bergen for a trip to Holland. They left Holland for a trip to England, and on Sept. 1, 1807, Tolleif and other crew members were captured in Yarmouth (Norfolk), England. Capture of a ship that broke the blockade was regarded as a legal form of piracy, and it is possible the ship Tolleif was aboard was one of the first Norwegian ships taken for blockade running. His ship was taken the day before the English bombarded Copenhagen. In the English Admiralty archive in the Public Records Service in London you can find a register with a catalog of war captures from the time of the Napoleonic Wars. On the initiative of the former school chief in Lillesand, Kjell Rosenberg, this important record of the Danish-Norwegian prisoners was copied in 1979 to six microfilms. The microfilms have since been available to the public both at the State Archive in Kristiansand and Aust-Agder Archive in Arendal. A data base of some of these records is now in the Digital Archive posted on the Internet. It was mainly brigs and ketches that were used in foreign trade. 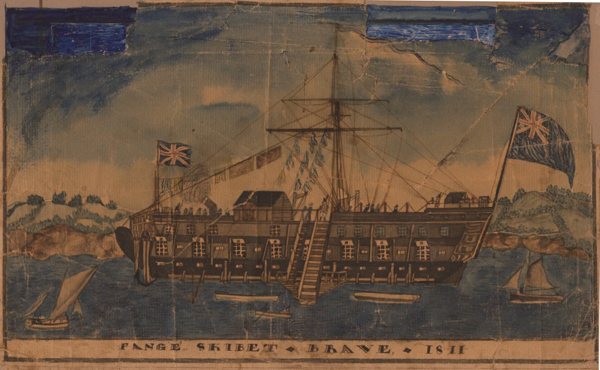 A brig is the larger of the two ship types and was typically the ship used for voyages to Mediterranean Sea ports and carried the biggest share of this import and export trade. Ketches, which are considerably smaller than brigs, were also used in foreign trade. They were used mostly for voyages to harbors in northwestern Europe but were also used for trips to southern Europe. Tolleif George Thomsen wrote that the ship Tolleif was aboard belonged to the preacher Hans Nilsen Hauge. I haven't been able to check if this is correct, or to find out what type of ship it was. But the ship was called "Welforenniet" (Well United) and was a merchant ship. Gullik Pedersen, able seaman, 14, Bergen. Torbjørn Knudsen, able seaman, 43, Bergen. Read more about Torbjørn. Records of another 1,500 to 2,000 people are on the microfilms but not in the database. The word prison in the records refers not just to penitentiaries but to the prisoner of war camps operated by the British during the Napoleonic Wars. In these camps were jailed for shorter or longer periods men and boys of all ages. The majority were seamen from merchant ships that had been captured by the English. The rest were in general crewmen from Danish and Norwegian privateering ships or members of the Danish-Norwegian navy. Some soldiers, many from the Danish islands of St. Thomsas and St. Croix in the Caribbean Sea, were also found among the prisoners. The biggest single group taken to prison at one time were crewmen from the warships Prince Christian Frederick, Denmark-Norway's last usable navy ship, which surrendered off Zealand Cape on March 22, 1808. About 370 of the crew were then taken to prison in England. 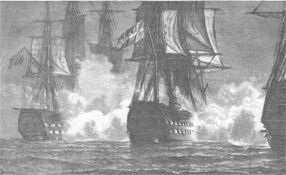 The PRINCE CHRISTIAN FREDERIK's last fight. There were two main types of prison camps, land prison and ship prison. Land prisons can be divided into open and closed (or locked) land prisons. On prison ships and in the closed land prisons, the captives were kept under lock and key with military guards and mainly at the expense of the English. In the open land prisons, trustees or parolees were kept at their own expense, but with a per-day grant or subsidy from the Danish government. All prisoners got something, but the parole or trustee prisoners got a little more. These prisoners also got some privileges and could move about more freely, but they had to swear that they wouldn't try to escape. The open prisons were mainly used for navy and other military officers, some civilians, and higher ships officers from the merchant fleet. They had the right to bring with them a servant, usually a boy. The main group of parole prisoners were ship captains and mates with their servants or cabin boys. Land prisons were scattered widely around Great Britain. The most important camps were in Reading, about 50 km west of London, and Ashburton, in Devon about 30 km northeast of Plymouth. Other such camps were in Moreton Hampstead, Northampton and Peebles (in Scotland). The largest closed or locked prison was in Greenlaw in Scotland near the small city of Pennyquick, now called Glencorse Barrack, about 15 km south of Edinburgh. Of lesser importance were Bristol, Yarmouth and Bishop's Waltham. Other closed or locked land prisons mentioned were Norman Cross in Huntingdon, which was the first camp especially for POWs, and Dartmoor in Devon, where the majority of prisoners were French. Most of the officers from privateer ships and most of the Danish-Norwegian prisoners were, however, placed in the infamous prison ships in the bay out from the small towns of Chatham and Gillingham (near the mouth of the Thames River), Plymouth in Devon and Portsmouth in Hampshire. Mention must also be made that 200-300 were held on the British island of Barbados in the Caribbean during the first three or four months of 1808, while more than 1,200 people were imprisoned at Gothenburg, Sweden, from late winter or spring 1809 until early the same fall (Sweden had concluded an alliance with England on Feb. 2, 1808). After a while, the biggest share of the Danish-Norwegian prisoners were collected in Chatham, Plymouth and Portsmouth. The notorious, stinking prison ships were old navy vessels, partly of English origin, partly captured French, Spanish, Dutch and Danish ships. They were anchored in a row in the waters off the ports, without masts or tillers and isolated from land. Tolleif was, as mentioned, captured in Yarmouth and was probably held there to begin with in the locked land prison, but he and the two shipmates I named earlier were transfered to Chatham Dec. 03, 1807. Near Chatham-Gillingham lay 12 prison ships and a hospital ship. Which of these dreadful vessels Tolleif was aboard I don't know, but the 12 ships were named Fyen, Kronprins Fredrik, Nassau (earlier Holsten), Crusty, Sampson, Buckingham (later replaced by Brunswick), Irresistible, Bahama, Canada, Glory and Belliqueux. The first three were captured near Copenhagen in, respectively, 1807, 1807 and 1801. In Plymouth there were first eight, then 12, ships in addition of a hospital ship: Prince, Panther, Bienfaisant, Brave, St. Nicolas, Europe, St. Isodore, Hector, Fame, Ganges, Genereux and Oiseau. Of the eight more ships at Portsmouth only the names Proteus, Niger and hospital ship Gladiator are known. In Gothenburg was the English prison brig Nelly. The prison ships were under the jurisdiction of the English Admiralty. The control agency was the so-called Transport Office or Transport Board. The prison ship Brave. Drawned by the Norwegian prisoner Elling Fransen of Dybvaag. He, being a prisoner, was held captive, and allowed shoreleave on a limited basis. By using colors from rocks and materials from the shore, he was able to paint this picture of the ship. Tolleif was kept on one of the prison ships near Chatham. In most of the prison champs, the sailor-prisoners were continually under pressure from the English to enter English service in return for promises of release. A considerable share of the Danish-Norwegian war prisoners took the offer of berths on English merchant ships, most likely on East Indian ships. This manner of gaining release from captivity was disliked and disdained by the remaining prisoners and by public opinion in the homeland, but taking jobs on merchant ships was not yet considered treason. A good deal worse was to accept duty aboard a warship. Norwegians and Danes found aboard English navy ships by their countrymen was "rewarded" with a court martial. The Norwegian-born priest Ulrik Fredrik Rosing, who worked among prisoners until 1811, estimated that about 300 of the 7,000 prisoners went into English service, less than five percent. Tolleif was jailed along with the other prisoners aboard the prison ships. The data base shows that some were shot, while others died of different diseases, such as typhus, gangrene, hemorrhage, etc. Under these inhuman conditions Tolleif was held until Jan. 17, 1809. He was then, ironically enough, transferred to a ship with the name Better Times. It is possible that this was the ship he was aboard when the Norwegian prisoners mutinied on the way from Iceland to England (See "Tolleif Thomsen Saga" and "Mythic Mutiny). ID 563 Christian Christiansen were also transfered to the ship 'Bedre Tider'. According to Tolleif George, Tolleif was in prison for 2 1/2 years, but the period I describe above is from Sept. 1, 1807, to Jan. 17, 1809, just a scant 1 1/2 years. Certainly Tolleif could have been aboard the ship a year before the mutiny, or it could be another prison ship. Additional research will give us answers, but we have now come a long bit on the way. As mentioned earlier, the six microfilms contain information that is not in the Digital Archive. These microfilms should contain some very interesting information about Tolleif.